December 12, 2009 - Chief Test Pilot Military, Edward "Ed" Strongman, piloted Airbus first Military A400M military airlifter in Seville, Spain yesterday after departing at 10:15 AM local time, completing a successful maiden flight lasting 3 hours 47 minutes and landed at 14:02 local time. The flight was supported by Experimental Test Pilot Ignacio "Nacho" Lombo. The engineering team on board included Senior Flight Test Engineer Jean-Philippe Cottet who had responsibility for the powerplants. Senior Flight Test Engineer Eric Isorce oversaw aircraft systems and performance. Senior Flight Test Engineer Didier Ronceray with responsibility for the handling qualities of the aircraft; and Test Flight Engineer Gerard Leskerpit. The crew confirmed that the aircraft, known as MSN 1 and its four Europrop International TP400D turboprop engines performed as expected. Ed Strongman said: "We have had a very successful first flight - the take-off performance was impressive, we explored a lot of the operational flight envelope, and it was a delight to operate in such a well-designed cockpit with its easy interface to all the normal and military systems. I'm sure our customer pilots are really going to like it - we certainly did." Nacho Lombo added: "From the very beginning of the flight we were impressed by the ease of handling of the aircraft which was in line with what we experienced in the simulator. The aircraft, systems and engine performance were highly satisfactory. We sense the great potential of this magnificent machine. It has been an honour for all the crew to fly the A400M on its maiden flight, representing all the people involved in the programme." Chief Executive Officer Airbus Military, Domingo Urena-Raso, said: "I would like to congratulate Ed Strongman, Nacho Lombo and all of the flight-test team for completing the first flight of the A400M with great success. I am also deeply grateful to everyone in the design, manufacturing and early operations of this programme for their enormously hard work and dedication that have made this aircraft a reality. And I want to thank all those people in our industrial partners and suppliers, as well as our customers, who have contributed so much to the definition and creation of an outstanding product." 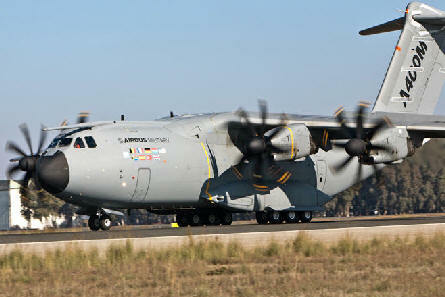 Airbus CEO Tom Enders said: "I hope we can soon provide certainty that we are able to continue the A400M programme. This is expected by those at Airbus, our partners and suppliers worldwide who contributed so strongly to today's success as well as by the air forces who wait for their plane." For its first flight the aircraft took off at a weight of 127 tonnes, carrying 15 tonnes of test equipment including two tonnes of water ballast, compared with its maximum take-off weight of 141 tonnes. As planned, the six-man crew extensively explored the aircraft's flight envelope in direct law, including a wide speed-range, and tested lowering and raising of the landing gear and high-lift devices at altitude. After checking the aircraft's performance in the landing configuration the crew landed back at Seville. In the first half of 2010 MSN 1 will be joined by two sister aircraft, MSN 2 and MSN 3, followed by MSN 4 by the end of the year. A fifth aircraft will join the programme during 2011. This fleet will be used for some 3,700 hours of test-flying between now and first delivery to the French Air Force at the end of 2012. This will be followed by additional military development flying. The type will be certificated by both the civil and military authorities. A total of 184 aircraft have so far been ordered by Belgium, France, Germany, Luxembourg, Malaysia, Spain, Turkey and the United Kingdom. Airbus Military is the only military and civil transport aircraft manufacturer to develop, produce, sell and support a comprehensive family of airlifters ranging from three to 37 tonnes of payload. Within Airbus, Airbus Military is responsible for the A400M programme, as well as for military tanker transport derivatives based on Airbus civil aircraft, with the integration of the state-of-the-art flight-refuelling boom (ARBS) which is unique in its class. With the C-295, CN-235 and C-212, Airbus Military is the global leader in the market segments for light and medium-sized military transport aircraft. Altogether Airbus Military has sold more than 1,000 aircraft with over 650 flying with more than 100 operators worldwid.